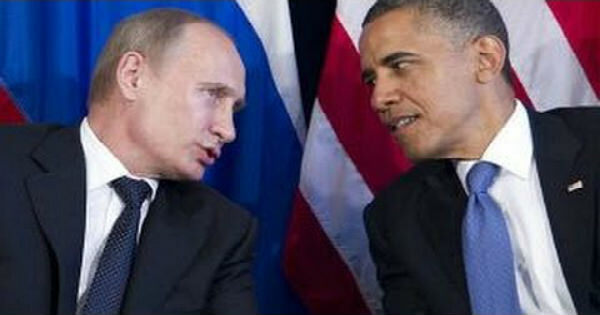 Watch Obama Embarrass Himself While Comparing Himself to Putin! I should point out, by the way, part of why the Russians have been effective on this is because they don’t go around announcing what they’re doing. The President was speaking negatively about Putin (and Russia’s) foreign policy but he inadvertently uncovered an important truth. It’s important, strategically, that your enemies (and maybe even your allies) not know what you are going to be doing. Sadly, while Obama realizes that this is one reason that Putin is successful, he completely misses the truth that it is also a reason that his administration has been so ineffectual. The President’s team is constantly announcing what they plan to do, foreign policy-wise, before they ever actually get around to doing it. Whether it’s drawing red lines in Syria, or telling ISIS when, where, and how we’ll be responding to their threat, or telegraphing for the world that we don’t take border security seriously. Obama is constantly failing, in part, because he literally gives his foreign policy gameplan away (to our enemies no less) before the game even starts! Our goal continues to be to send a clear message to Russia, or others, not to do this to us because we can do stuff to you. But it is also important for us to do that in a thoughtful, methodical way. Some of it we do publicly. Some of it we will do in a way that they know, but not everybody will. And I know there have been folks out there that suggest somehow, if we went out there and made big announcements and thumped our chests about a bunch of stuff, that somehow that would potentially spook the Russians. But keep in mind that we already have enormous numbers of sanctions against the Russians. The relationship between us and Russia has deteriorated, sadly, significantly over the last several years. And so, how we approach an appropriate response that increases costs for them for behavior like this in the future, but does not create problems for us, is something that’s worth taking the time to think through and figure out. And that’s exactly what we’ve done. So at a point in time where we’ve taken certain actions that we can divulge publicly we will do so. There are times where the message will be directly received by the Russians, and not publicized. He denies it. So the idea that somehow public shaming is going to be effective, I think, doesn’t read the thought process in Russia very well. You can see the Whole transcript at Whitehouse.gov.